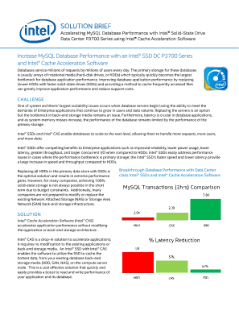 This solution brief shows how an Intel® SSD with Intel® CAS helps improve MySQL database performance, accelerate applications, and reduce storage bottlenecks by providing a cost-effective method to cache frequently accessed files. A new approach to cloud storage has helped Yahoo control costs, manage storage, and improve user experiences. The Intel® Data Center Manager predicts cooling issues with a patented algorithm that builds a model of temperature patterns. Guard Rail policy helps control systems to reduce power consumption and prevent server shutdowns.